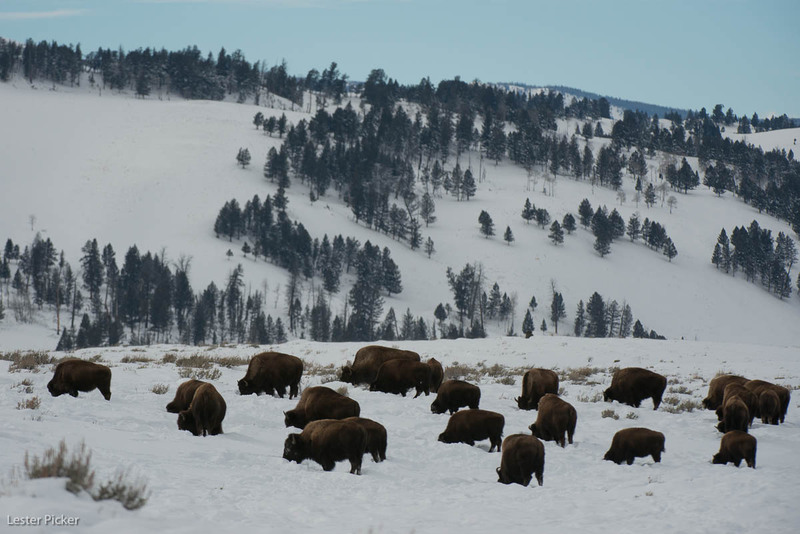 If there is one iconic species in Yellowstone, it would have to be the Bison. These immense creatures are the largest land mammals in America, with the bulls weighing around 2,000 pounds! Yellowstone bison were nearly eradicated by 1900, but in one of the most visible successes in the wildlife movement, Yellowstone now is home to between 3,000 and 4,000 of these magnificent creatures. In winter one has to share the road with bison, as you can see here in my 20-second little iPhone video clip. (NOTE: Please turn down your sound as the day was biting cold (-10F) and very windy). The bison graze for a few hours in the early morning, chew their cud and then mosey to a new location for their afternoon grazing. One gets a sense of just how difficult it is to survive through the winter in these parts. The bison use their nose and massive head as snowplows as they swing it from side to side, burrowing down into the snow to get to the dried grasses beneath. That chore is energy intensive, especially inm the cold, so these guys have to eat massive amounts of forage. It seems as if wherever one drives there are small herds of bison grazing in fields. They are skitterish and now that packs of wolves hunt in Yellowstone, they are constantly on alert. But humans, too, are well advised to keep their distance as every year people are hurt here when they approach too closely. Despite their size they can charge to 30mph incredibly quickly.